Ruth has been spending a lot of her free time on the internet, planning for South Korea. For the most part, I do the searching for the best travel prices (planes, trains, buses, etc.) and she does the searching for the best things to do once we get there! So far, it looks like we're not going to have much problem using up our 28 days there! You can see how close it is to both China (on the left) and Japan (on the lower right). To give you some idea of distance, it is about 450 kms (280 miles) from Seoul to Busan. They have a high speed rail system for taking people across the country between the two largest cities. It costs around $50 per person, with the train traveling at 300 km/h (180 mph)! I think I would like to experience that! We would also like to visit Jeju Island. You can see it near the center of the bottom of the map above. It's a popular tourist spot, but October is shoulder season and crowds (and prices) should be lower. And, we've been invited to stay with our friend June's parents. They live somewhere out in the country so it will be fun to do that! I wonder if they speak any English. We're going to have to buy a Korean/English dictionary. That ought to be interesting! There are also places for us to go hiking! Yep. 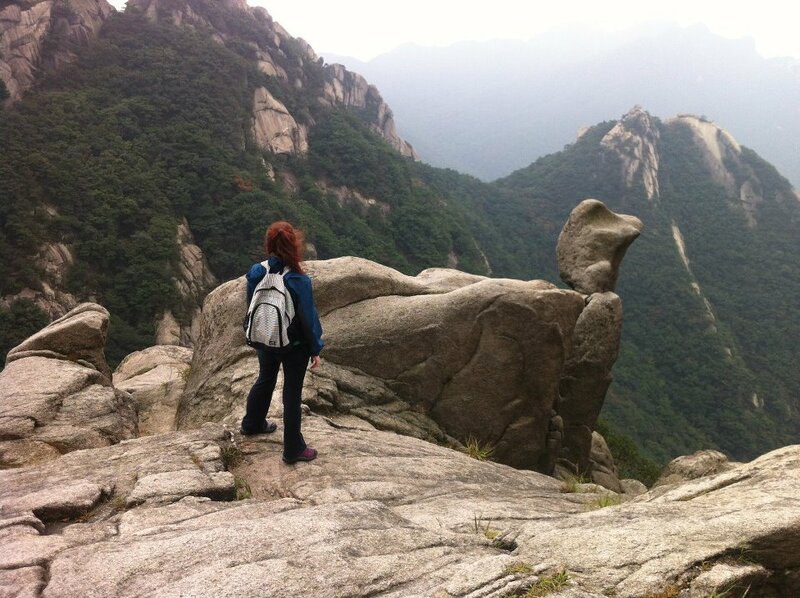 Definitely going hiking in South Korea! Four weeks isn't a really long time to explore a whole country, but when you consider that South Korea is smaller than the state of Nebraska, we should be able to do it justice! In the meantime, here's our Amazon deal of the day for our RV'ing readers! When I ran the parts department for an RV dealership, we sold a LOT of these little dishwashing racks. That's because they fit perfectly in most RV double sinks, and for rigs with single sinks their size takes up very little space on a typically tiny RV countertop! Currently on sale at less than half price, this is a great deal. Looks like you're going to have fun! I like countries that a Visa isn't required, only need to get fingerprinted. We haven't been to a country yet that we have had to get a Visa. Hopefully that will change some time in the future but it certainly is easier without one. Wow, can't wait for this trip, especially the hiking pics. The AMazon daily deals are interesting, I just bought my LED light bulbs from them, and a folding chair, I always shop there first, I have a student Prime Membership (borrowed my daughter's .edu address) it's much cheaper and love the 2 day shipping!! Here's another website I am on often, features a lot of Amazon deals: http://slickdeals.net/ . Keep up the good work w/ posting daily!! We can't wait either Leah, and it looks like there is lots of hiking available. I don't think four weeks is going to be long enough though! Having your daughter's student discount is a bonus and thanks for the link, it could also be helpful to us. We have friends that went to Seoul for a wedding and they had a great time there. Should be lots of fun. We have also been invited to a wedding while we are there. Weddings are sometimes one of the best ways to experience the culture of a country. We are so looking forward to our trip in October. Another fun adventure, we are looking forward to tag along. We can't wait to tell everyone about our adventures there. Only two and a half months to go!